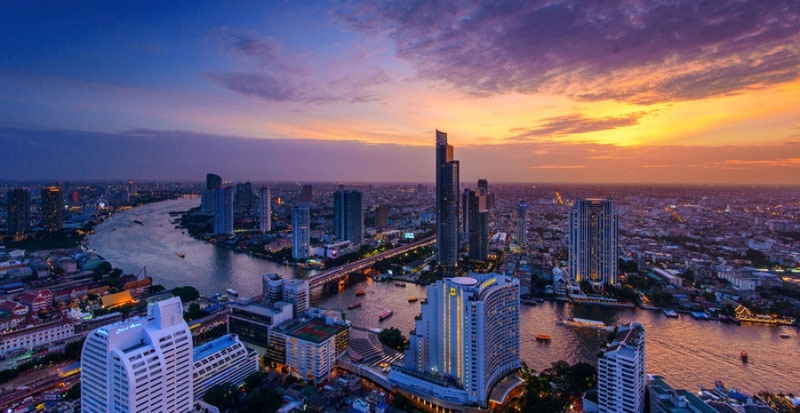 Six new luxury high-rise Condo Projects with a combined value of THB50 billion (USD 1.55 billion) are set to rise along the banks of Bangkok’s Chao Phraya River. Despite the limited supply of prime plots in the area, the new riverfront projects, which will primarily target expatriate investors, were green lit that will cover about a four- or five-kilometre stretch along Charoen Krung and Charoen Nakhon roads. The new structures will stand adjacent to the existing fifteen luxury properties near the river. The largest development is a THB30 billion (USD931 million) joint venture by Siam Piwat, Magnolia Quality Development Corporation and Charoen Pokphand Group. It will be a mixed-use complex to be built on a 16-acre plot that will house a hotel, residential and retail spaces. Country Group Development PLC will also establish a THB10 billion (USD310 million) mixed-use Landmark Waterfront property on a 14-acre land comprising 352 condominium units, a 101-unit Capella-branded hotel and a 305-room hotel to be operated by Dubai-based Jumeriah. Other high-profile riverfront projects include The Peninsula Bangkok in Klong San worth THB5 billion (USD155 million), the Avani-branded hotel by Minor Hotel Group, the 294-unit Menam Residences valued at THB3.3 billion (USD102 million), and Raimon Land’s THB1 billion (USD31 million) project The River Residences, which will launch 92 buy-to-let units in June. Developers are marketing the properties to affluent locals and expats, especially from China, Hong Kong, Japan, Singapore and the United Kingdom, according to Bangkok Post.